This interactive presentation contains the latest gas (and a little oil) production data from all 10,076 horizontal wells in Pennsylvania and Ohio that started production since 2010, through December. This update includes the production numbers for Q4 2017 that were recently released by Ohio. For completeness I also include Pennsylvania and West Virginia, although the latter state is deselected in most views as it only has published data through 2016. As shown in the above graph, gas production from unconventional horizontal wells in the Appalachian basin (excluding West Virginia) experienced a strong boost in the final 2 months of 2017, climbing over 2 Bcf/d (>10%). Also in this basin initial well productivity is up significantly, as you can see in the ‘Well quality’ overview. The average new well in these 2 states reaches a rate now of more than 10 MMcf/d in its peak month. The number of drilled, but uncompleted wells (DUCs) has remained rather steady over the past year (see the ‘Well status’ overview). Chesapeake and Cabot are the 2 leading gas producers in this area, as the final tab shows (‘top operators’), with the latter one having almost all its holdings in just a single county (Susquehanna). If you include West Virginia in this overview you’ll note that EQT and Antero Resources are very large gas operators (>= 2 Bcf/d) here as well. This “Ultimate Return” overview shows the relationship between gas production rates, and cumulative gas production, averaged for all horizontal wells that started production in a certain year. I have selected only Ohio here. If you follow the light green curve, you can find that in the first 13 months of production, the average 2016 well produced more natural gas (~3 Bcf) than earlier wells did in more than double this time span. But as the orange curve shows, the wells that started producing in 2015 are declining somewhat faster than the wells from the previous year, after one year of production, so it will be interesting to see how the newer wells will behave after their first year. By changing the ‘Show wells by’ selection to quarter or month of first flow, more recent and granular data is shown. It also reveals that newer wells produce several months longer at a high rate, before their decline sets in. This change in production profile can also be seen in several other basins. In the 2nd tab (“Cumulative production ranking”) the cumulative production for all these wells is shown. The top well, which started 5 years earlier, has produced over 20 Bcf now, and was in December still producing at a rate of 4.7 MMcf/d. In the coming 1.5 week I will have a new post on a projection of the output from all covered US shale wells into the future. 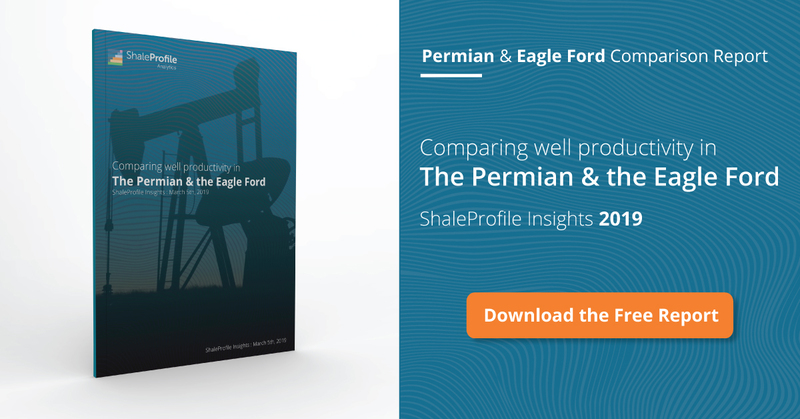 After that, I will have an update on the Permian with data through the end of last year.